Signed by Jules David, a prominent French painter and lithographer, who introduced naturalistic situations to fashion illustration. 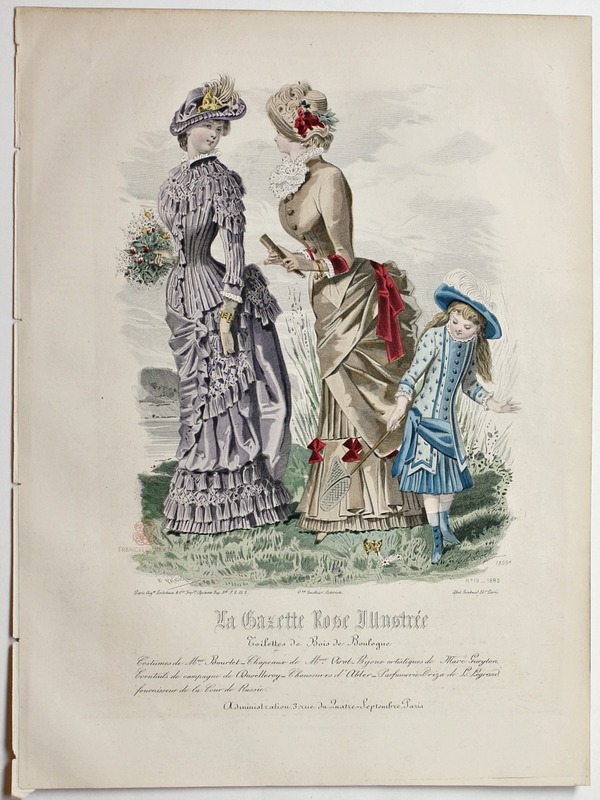 Colored with bright water colors, this print shows two ladies and a little girl out for a walk, each wearing beautiful period clothing. The scene is delightful, with the little girl trying to catch a butterly with her net, she is wearing a floral blue dress, and a spring hat with feathers. The two gorgeous ladies walking with her are dressed in luxury, one wears a lavender purple bustle gown covered with tassels, the other wears a pink rose brown velvet costume with lace and velvet ribbons. Wearing gloves, one lady holds a bouquet of flowers, the other her fan. The detail is gorgeous.